Today, US for Palin is pleased to feature Nancy French, the co-author of Bristol Palin’s Not Afraid of Life. In “What It Was Like to Co-Write the Bristol Palin Memoir,” Nancy gives her unique perspective on co-writing Bristol’s book during the month she spent with the Palins. Nancy also co-authored Home and Away: A Story of Family in a Time of War with her husband David. He was in Iraq on the front lines while she was home. Track Palin went to the same province in Iraq, just a few days after David left it. This circumstance may have been a factor in Bristol selecting Nancy as her co-author. 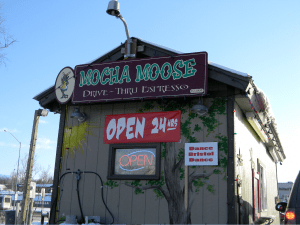 Nancy shared with me that during her stay in Wasilla, she frequented the Mocha Moose on West Parks Highway, which brews Governor Palin’s favorite coffee Good Morning Alaska. I routinely have 1-lb. bags of it shipped to my home and it is by far my favorite coffee as well along with its high-octane counterpart Whoa Nellie! The Mocha Moose proudly supports the Palins as evidenced by the “Dance Bristol Dance” sign on their building. My friends and I huddled around my iPhone, as we listened to my agent’s voicemail. I never considered myself a “ghost writer,” since I’ve published my own memoir about being a southerner living in New York and a book about Iraq I co-authored with my husband about his deployment and it’s effect on our family. I was definitely interested, however, and the mystery only deepened my interest. Immediately, my friends and I began guessing. Miley Cyrus? Taylor Swift? Because I live near Nashville, Tennessee, I assumed they were interested in my geographic location as much as my writing ability. Surely, an up-and-coming country musician needed help with her book, and I was exactly the kind of local writer who could pop in and out with minimal inconvenience. I tried to imagine that conversation, Momma Grizzly herself having a discussion with her daughter about me – a writer who lives in the Mule Capital of the World, Columbia, Tennessee. It seemed too surreal to be true. Within days, however, I was in Wasilla, Alaska. She led me to where I’d be living for the next month, in a detached building on the Palin’s property, where Gov. Palin films her Fox interviews. In fact, I frequently wrote perched high in her chair, with a frozen Lake Lucille outside the tall windows. Cars drove by slowly on the lake, no doubt taking photos of their house. Some did “donuts” and skidded around on the ice. A couple of guys were ice fishing. A moose slowly ambled across the frozen water and made his way to the Palin’s house.